Posing a question, one of the oldest tricks in the book, remains one of the best ways to engage a reader. Features tend to bore readers. Make an emotional appeal by putting benefits in your headline. A proven headline approach is to begin with a topical keyword phrase, followed by a colon – or dash – followed by a statement or question. A headline using “do” or “don’t” indicates your content is going to advise on what does or doesn’t work for a task your audience needs to accomplish. Decisions are based on emotions. Capitalize on that power using the headline to elicit a feeling or to describe one. A well-timed, topical, or provocative fact (or list of them) can be the ultimate hook for your story. No matter what you’re writing, you likely can attach “greats” to it – great accomplishments, great leaders, great landmarks in time, etc. Help is a universal foundation of content marketing, nonfiction, and so many forms of publishing. Identify how the content will aid the reader or viewer. “Jack” – as in steal or borrow – is a helpful tool. Craft a headline that borrows interest from a trending story or famous figure discussed in the media. Craft your headlines to include keywords and phrases people use when searching. Lists work. Readers instantly know what they’re getting and appreciate how lists bring order to the content topic. Mistakes, misconceptions, myths … negative headlines have tremendous pulling power. Add intrigue to your headlines by citing results, time frames, measurements, or anything that can be enumerated. Indicate you’re going to express your opinion – or that of another expert – and you’re likely to woo many readers. Revisit your headline looking for soft or vague words that can be replaced with more powerful, energetic, emotional, or descriptive words. Use a quote from a speech, interview, research report, song, movie, or anything you believe makes for a tasty appetizer for the content soon to be served. Headlines for roundups almost write themselves. How many experts? What will they share? Getting started tends to be the hardest part of a task. Indicate that your content presents the reader with an effective way to begin that task. A derivative of the how-to headline, write it to reveal how x can produce y. Start with a verb. Make the verb urgent and interesting. Inject action into your headlines with interesting verbs. Whether your headline is a question or a statement, these five “w” words can help shape an interesting one. eXamples give an exciting way to tee up your content. Showcase a person, group, companies, accomplishments, or any type of relevant example. 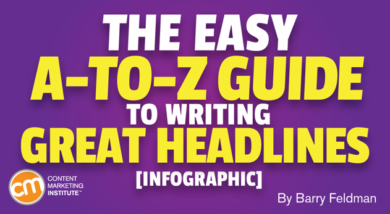 Your headline can’t call the reader by name, but the word “you” is the next best thing. A zinger is a quip or phrase that comes last. Add zing with a subhed (or place a thought in parentheses). Crafting a great headline is not easy. Using these tips (though not all in the same headline) will attract your readers to your content. Then look at your content analytics to see which of these tips worked better than others for your audience. And repeat those. Learn tips, tactics, strategy, and more at Content Marketing World Sept. 3-6 in Cleveland, Ohio. Register today using code BLOG100 to save $100.